Although we've spoken about Resa Design before, they've added some amazing new products and fabrics to their line-up. With Resa Design it's your baby, your style. They specialize in the gear you need most as a mother. Bibs, changing pads, receiving blankets, burp cloths and of course there's the always stylish and modern customizable clothing. Every item I have from Resa Design has been used time and again, each product makes my life a little easier, plainly put, Resa Design simplifies. They don't make things you'll stuff in a drawer and forget you have. For your baby or the perfect gift for a friend you'll find classic styles and designs you can use year after year or baby after baby. So whether you keep it all for yourself, or divide it up among friends and loved ones, you'll have the very best in useable baby gear. Oh how good is that? Which Resa Design would you most like to have? Good Luck and Thank You Resa Design! all of it! that set sounds amazing considering we are having our first this spring and we don't have anything yet for the little guy. great giveaway! I'd love the signature tee for my son. So cute. I love the Anywhere dress! So adorable and versatile!! I love love the little gowns with customized letters! I may have to get Milo an "M". And I'm sure the turtle gear in the giveaway would be perfect for him! Love that Blue Dot Turtle! I'd want it on ANYTHING... it matches our theme perfectly! I love all of their item! I really like the big and little sibling tees. I have a toddler and a little one on the way in a few weeks. It would be fun to have those for our boys when the baby arrives! I also really love the custom gowns and the birthday tess. Too cute. Jacob needs a big brother t-shirt for when his sister comes in April and she needs a little suster onesie! As for the giveway, the timing would be perfect for my new baby!!! I am all about dressing my new (and first) baby girl so I would have to go with the Anywhere Dress. This is a great giveaway today! I love the Anywhere dress for my little girl. The fabrics are lovely! I just gave my little girl a baby brother and the sibling tees are so sweet!! I also love the perfect fit blankets... good swaddling blankets are hard to find, ya know?? Wow, these patterns are wonderful! Such a breath of fresh air up against all of the pastels you find most places. Any of these designs would be great! My girls need the everywhere dress. Im diggin the anywhere dress. Love the Anywhere dress. So versatile! I would most like to have a Birthday T. My daughter's birthday is next month and I think she'd love it. I would get the 6 with the hot dot blue fabric. Love the perfect fit blankets! The chocolate design is beautiful! I love the Tweet design. I'd love to try one of their tees. All of their stuff is yummy. i love all of the designs and colors. so pretty! oh, i have loved resa design for so, so long ... just haven't treated myself to any of her goodies yet! love her signature tees (!!!) and plan on using her 'big brother' tee in the near future, i hope, for a fun announcement ...! i think the turtle tee would go perfectly with my little boy! Thanks for the giveaway! I love the birthday tees...and I have some friends who would love the giveaway loot as baby gifts. The pefect fit blanket in dot dash looks like a winner! It is all very cute...the alphabet tees, the anywhere dress, and the blankets in the fun fabric. THanks! The sweet pea tee is adorable!! I really like all of them, but I would have to say that the new "Chocolate" fabric is my favorite. I love the designs and fabrics. I wish I had known about this site months ago! I love the receiving blankets. They look like the perfect thickness for swaddling a newborn. All of her stuff is so darling. I love the fabric she uses... particularly the clay and green apple. Due in April and would love to win this one! I could use the big and little sibling tees. Love the custom gowns...for our new baby on the way! So simple, that is what I love about Resa's Designs. resa designs are some of my very favorite...I especially love the anywhere dress! Its so hard to choose, but I love the perfect fit blanket! I love the patterns on the clothes. My sister is expecting and would love the new baby outfit or the anywhere dress for my niece. I love Resa Design products! I have a onsie and changing pad that are so cute. I would love to win these other goodies and share them with my sister who is having her first boy! I have a good friend AND a sister bringing babies into the world in July. I'd love to win so I could give them one of these great Resa Designs... They're so perfect for newborns! I love the receiving blankets and the signature tee! The opal and cherries designs are my favorites... I love that this company is giving back through their Operation Baby Shower for military families expecting babies, a great idea! How fun would it be to share all these goodies with a few of my friends who are expecting babies in 2009! I love those receiving blankets! WAY cute! I might have to order the custom gowns and the birthday tee. Oh my goodness, I have to have that turtle dot onesie. That is the cutest. I love the new Tweet design! Love the swaddling blankets, and our girls would have so much fun in the anywhere dress. The initial tees are great also. Everything looks wonderful. I love resa designs. I have one of their receiving blankets and love it! I love the spot pattern changing pad..so cute.. I absolutly love the new kiwi fabric and would like just about anything with that fabric. So cute and fun. Loving all their designs... but particularly the Anywhere Dress in Citrus! Amazing giveaway...and being pregnant and ready to pop it all would be perfect! Love the signature tee. I love the Sleep:Baby gift set- the turtles are so cute! I love the birthday tee-so cute! The fabrics are fabulous! i'd love the olive green bird on just about anything! super duper fabulousness! their new "elephant" print is the one i'd choose. super cute fabrics! what a nice giveaway...thanks! Wow - awesome giveaway. I just have to have the anywhere dress for my little girl! -Kristin R.
I'm a succor for the polka-dot receiving blanket! Her prices are amazing! Pick just one? I love them all! I really am into their blankets...the girls ones are to die for! I really like the Opal material! I agree with Resa, that it's so hard to find a perfect receiving blanket. So I'd stock up on those. I've been looking for good blankets for our baby boy who is due in a few weeks. Love love love! Especially everything hot dot blue turtle. Due date in 8 weeks! thanks for sharing. Would be so happy to add a changing pad and blankie to my tote bag. I'd get the birthday tee for my little ones first! LOVE LOVE all of the stuff. I love that they even have cute stuff for boys. I love the turtle, turtles are so cute! What a hard choice! I would have to go with the anywhere dress because I'm a sucker for cute dresses for my girls. I would love the new baby set and big brother shirt.. Its all so sweet. Sweet! 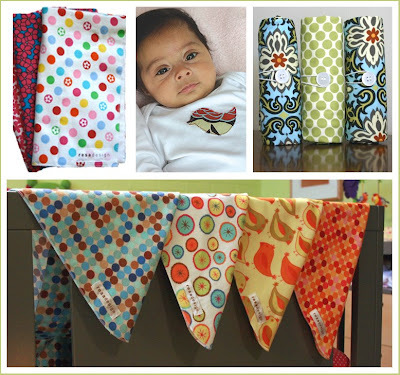 The Resa Design::Burp Cloths are lovely. I like all the different design selections. The flowers are nice. Thanks. I love the anywhere dress for my little girls. I would love the receiving blanket in chocolate and then everything else! Everything is SO cute!! I live the anywhere dresses. And everything else! oh my, i love it all!! all their blanket prints are fabulous and I love the sibling tees! I would love to get a birthday tee for my upcoming 3-yr-old's birthday!! The Anywhere Dress in citrus would be perfect for my girl! Thanks for another great giveaway. I really like that 'anywhere' dress. I love the swaddling blanket in green apple. All of the fabrics are hip. I love it all! i've been wanting a signature t or custom gown for my april baby! but i'd love to win this giveaway even more!!! I love the signature tee. Love it all! Great fabrics. I LOVE the 4 Tee, esp. since my little one is getting ready to turn the big 4 himself! Love the sweet pea tee and the anywhere dresses--adorable. The wet happened bag is pretty nice too! I love the Alphabet & Shape Tee and how customizable it is! I love the anywhere dress, but the perfect fit blanket is probably something I "need" more! I would love the number tee's for my girls birthdays! the opal receiving blanket is very cute! I've got a new baby girl this would be perfect for. Lovely, lovely. All of the appliqued tees are adorable! I love everything but I really would love the b-day tee for my son's upcoming birthday! I would love the anywhere dress for my little girl! So adorable! I'd love the turtle. It would be perfect for my brand new little grandson (3 weeks old) Thanks. Oh I want all of it! They are all so darlig. It is impossible to choose. Oh, I love the receiving blankets and the alpahbet tees. We just found out yesterday that we are expecting a little boy, so this would be the perfect gift to start our collection! I love the anywhere dress! So adorable! I love the apple design because I think it could be for a boy or little girl! But they are all adorable! oh i LOVE the sibling tees and the signature tees... i love all her fabrics, totally modern and beautiful. gorgeous! i adore those changing pads and burp cloths. I am very into swaddling...and I love little dresses. I hope I win. I think the hot dot blue turtle is so cute, this would be so great for gifts or for me...with a baby boy on the way :)! Anything appliqued! I am in love with this stuff...especially the onsies. GREAT give-away! The burbcloths look great. You can't get enough of those! Great stuff! I love the appliques! The set sounds wonderful for our baby on the way. I'm also in love with the anywhere dress for my toddler. That set is to die for! I really love the perfect fit blankets. I love the blankets. They are so cute! Everything is so cute!! I love the birthday tees. I've always loved the Alphabet and Shape design. Very cool. I love love love the burp cloths with those big buttons! All of the fabric is beautiful. Love the prints! The anywhere dress (in clay) is very cute and pretty! I know the Resa designs are popular, but it's for a reason, they are amazing! I'd have to get a dress for my little girl. I love the idea of the birthday tees! The birthday tees are cute and what kid can't use an extra t-shirt? Oh man, I LOVE the custom gowns for those itsy bitsy babies, and then the every day dress....LOVE IT! ALL of their designs are so beautiful.... even if I don't win (which I really hope I do) I'll have to grab some stuff off their website!!! Thanks for doing these giveaways... it's so fun! I love the alphabet & shape tee...my daughter loves things with her initial K on it! Hands down I would pick the sibling t's and onesie. I have been looking for cute ones everywhere! I love the perfect fit receiving blanket--the chocolate fabric. So cute! Love the blankets! Great prints. Also like the turtle design. Perfect for baby boy #1. The birthday tees are so fun-I can just picture my daughter wearing her #4 proudly. And the big sibling tees come in a close second for me! These are adorable and I would love the anywhere dress. So cute. The clay Anywhere Dress is darling. I love the fabrics Resa Design uses. Kristin H.
You think I'm able to just say my one favorite? i love the signature tees, perfect fit blanket, etc. Not to mention the fabric is to die for! Love the Anywhere Dress in Clay. I really love the changing pad with the dots. Very cute designs! The birthday t is so special. Makes a kid feel so grown up, I'm sure! Oh, they're all so cute! I just love the sleep:baby set! Love the signature tees but really what's not to love all over the place. Set would come in handy with my twins on the way. I love all of their designs, especially the apple! I love the anywhere dress! What an awesome site! i love RESA DESIGNS!!! i have been wanting to get one of their perfect fit/receiving blankets!! I love their sibling Tees, adorable! I'm due with my second daughter in April, so I'd love the sibling tee. Or the receiving blankets- I'm big on swaddling too. my friends are adopting and this would be perfect! i love the anywhere dress! I'm in love with this giveaway. Those custom gowns and signature tees would be great for our new baby. SO CUTE! I like the heart tee! So cute! I'm due in June, so any of the newborn stuff, especially the receiving blanket would be my choice. So pretty! I love the little bird applique!Count me in please! I love the alphabet tees. Anything that has initials is a fave! I love the perfect fit blanket. polka dots are SO my thing. It all looks fantastic! I am smitten with the tweet blanket. Thanks for the giveaway resa design! I would love a stylish changing pad. And the olive green would be perfect! Oh these are gorgeous! I am loving the citrus and bird designs for my little girlie. I really love the Perfect Fit Dot-Dash blanket. I've always loved the look of Resa Design-Thanks!! I love resa! All of her things are so cute, and so versitile!! We would love to own any of these items! Those designs are great! I love the "dot dash" fabric for the burp cloth! love the initial onsies. so cute! i could also use one of the changing pads. I adore the birthday tees. Such creative designs. I would enjoy the perfect fit blacket. I looks so snuggly. I love the Anywhere dress. My 2 yr old DD loves to dress in layers & it's perfect for her style. I love the birthday tees, but everything is so cute. I love them all, but you can never have enough blankets! So adorable. I would love the anywhere dress for my little girl! I like the birthday shirt for my little guys 1st birthday or the anywhere dress for my daughter. The baby super set or the anywhere dress so would be perfect. Thanks. I love love LOVE the alphabet T! So adorable! What a great giveaway! I'd have to choose the Perfect Fit Blanket for sure. I would love to have the signature tee or birthday tee for my nephew who is turning 2 on Feb. 6th! He would look adorable in these cute tees! Would love a Resa custom gown with the bird for my little one. I think the little alphabet shirts are so cute. I love her changing pad in Olive Pink. So darling. Really I would love it all! What great products. The custom blanket is great! I love the simplicity of the baby items. I love the signature tees. So cute. The anywhere dress is adorable. I love the style. I love the birthday tees! So cute for my little guy. My name is Shanda and I love the anywhere dress. it's so adorable. I also love the sibblings t's. The birthday tees are so cute! I would love the anywhere dress for my daughter! Wow, what a great giveaway! I love the big siblings tees. So awesome. the dribbler bib is to die for! I LOVE the "anywhere dress". My granddaughters would look darling in them. I love the custom blanket. I really like the apple with the dot fabric, super cute. Wow! So adorable! The one I like best is the Alphabet and shape tee. I'd love to have one with an I and one with an O for my twins. Love it! I would love a custom blanket in temple - so cute! I LOVE the alphabet tees and the birthday tees. Oh and the big brother tee. SO many darling choices! Love it all!! I love all of it, especially the tweet! Their custom gowns are so great! I like how they can put a letter on it. That's so great! Anything from Resa Designs would be great!! I would choose the initial tees for my new baby grandson due any day! Their signature Tees are great! I love the tees - the hot dot turtle is adorable! I love it all, the birthday tees, receiving blankets, the cute dress!! !